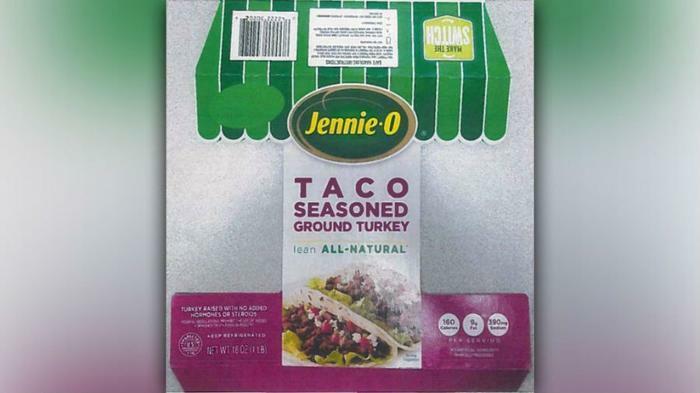 Amid an ongoing salmonella outbreak linked to raw turkey, Jennie-O Turkey has issued a recall for a specific line of its ground turkey products. The company recalled 91,388 pounds of its raw ground turkey products after the United States Department of Agriculture's (USDA) Food Safety and Inspection Service (FSIS) found that a sample of the products tested positive for a salmonella reading matching the outbreak strain. The samples used in the investigation were produced on September 11, 2018, the USDA said. Consumers who may have the recalled product in their freezer are urged not to eat it. Instead, the USDA says consumers should throw it away or return it to the place of purchase. The outbreak started in November of 2017 and has sickened at least 164 in 35 states since then. One person in California has died and 63 people have been hospitalized. Federal health officials said previously that the outbreak appeared to be “widespread in the turkey industry,” but stopped short of naming any specific brands linked to the outbreak. Earlier this week, consumer advocacy groups put pressure on the USDA to name the brands linked to this particular strain of salmonella. The USDA maintains that there does not appear to be one single source of the outbreak, suggesting that the outbreak “might be widespread in the turkey industry.” The agency said it’s been working closely with the CDC and state public health and agriculture partners to investigate the illness cluster. “Patients have reported eating different types and brands of turkey products purchased from many different stores, handling raw turkey pet food and/or raw turkey, or working with live turkeys or living with someone who handled live turkeys,” the USDA said in a statement. Separate: Separate raw meat from other foods.